The Mesozoic portion of the former USGS Menlo Park Invertebrate Collection, now housed in UCMP's off campus Regatta Collections Facility, required extensive reorganization. After assigning stratigraphic ages to each locality this past summer, we have spent the fall rehousing these fossils into new archival specimen boxes arranged in steel museum drawers and cabinets. Approximately 17,000 specimens from a collection of over 100,000 have been rehoused, resulting in ten cabinets full of spectacular Jurassic and Cretaceous fossils collected from the San Francisco Bay Area to the southern coast of England. Along the way, we have reunited many "stray" fossils stored in separate drawers, moved Alaskan fossils back to UCMP on campus, and continue to be impressed with the diverse and abundant fossils collected at many localities and their stunning degree of preservation. One exception to the UCMP's stratigraphic arrangement of localities and fossils are the systematic collections, such as Cliff Nelson's Ph.D. thesis collection of Neptunea (see the blog post). Other systematic collections include Mesozoic taxa such as Buchia, Trigonia, and Inoceramus, as well as ammonites. Many of our student workers have returned from last year, and the new students working on the project are a tremendous asset! UCMP volunteers Kathy Zoehfeld and Don Pecko continue to enthusiastically assist with tasks large and small, and always contribute great ideas! All of the Mesozoic localities are now available in the UCMP locality database and the Cenozoic localities will soon follow. Please check out the new Researcher's Guide to the USGS Collection for more information! Some specimens from the USGS collection. 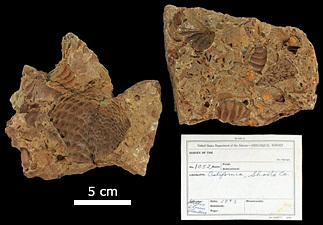 Above: Inoceramid from Luna County, New Mexico, collected in 1976. Right: Trigoniidae specimen from Shasta County, California, collected in 1893. Photos by the UCMP Invertebrate Collection crew.